The canyon containing Elliot’s Left Hand. 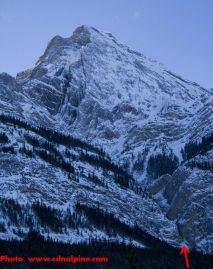 Approach: Drive down Highway 11 for about 25 minutes from the Icefields Parkway until below Mt. Elliot (see photo). Park at a small dirt road leading down towards Abraham Lake, there is a small sign on the opposite side of the road labeled “Range Rd 18-0A”. Walk south (west) along the highway for a short distance watching for flagging tape marking the trail on the right side of the drainage. If you can’t find the often overgrown trail, just follow the drainage. About 1 hour to reach the climb. 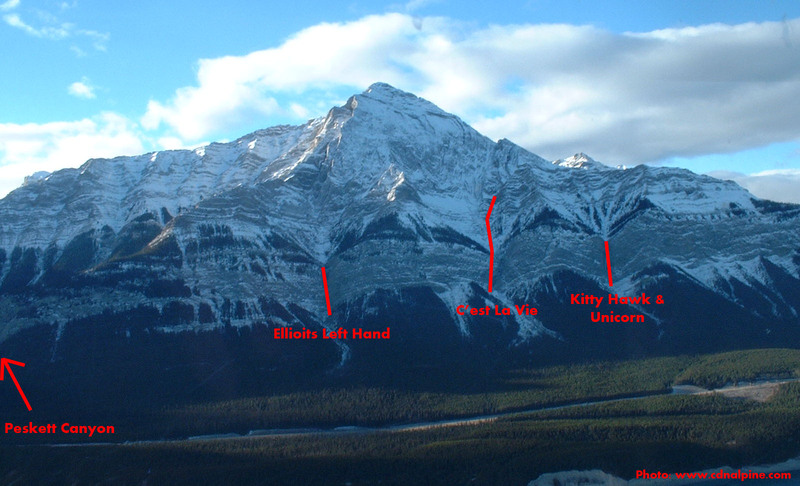 Overview of routes on Mt. Elliot, including Elliot’s Left Hand. 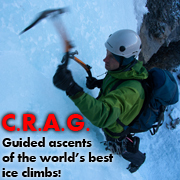 Route Description: Climb a long pitch of WI3 that is often wet & dense at the same time to a chain anchor on the left. There is also a short bolted mixed variation called “Hosers Against Bush” (M6) on the left side, although it is often covered with ice. Continue up the winding canyon past a number of fun steps until reaching a snow bowl and the final crux pitch. The crux curtain is about 40m long and ranges from easy WI4 to WI5 depending upon ice quality. Descent: Rappel the top pitch on a V-thread, then rap the rest of the route on bolted anchors if you can find them. Gear: Screws. 2 ropes speed up the descent.